In April 2009 David Irving sat for a privately filmed interview lasting many hours, designed to become the basis of a major documentary on his life and his often controversial opinions on history. Eventually the film will be released with full documentation, newsreel inserts, and all the other paraphernalia and embellishments of film history. What we have here however is film in the raw, uncut and unedited, ready for the producer’s knife and the editor’s brush and palette. In the first part of this film, the writer talks about the England he comes from, the way in which he formed his beliefs, and how he became one for the world’s best selling historians - through perseverance with sources, and fair play towards defeated enemies. The story takes a sinister turn, as he relates how the traditional enemies of free speech mounted a global vendetta to silence him around the world - but failed. In the second part, the writer talks about the controversy surrounding what has, since the 1970s, become known as the Holocaust, and what historians should make of it. he will enrage both friend and foe in this two hour unvarnished talk; but they may find it hard to fault his arguments. As the description says, this DVD is completely unedited. 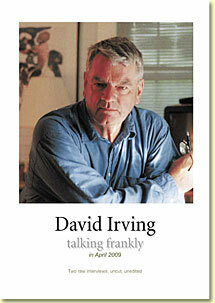 Mr Irving really is "talking frankly". 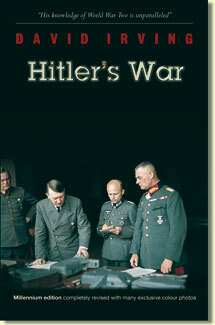 The first part of the DVD is about his life and career and the second part addresses a lot of FAQ about the holocaust. Fans of David Irving, particularly those who don't have an opportunity to attend his talks in person, will enjoy this DVD about their favourite author and historian.